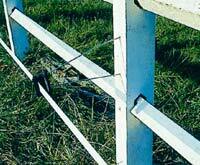 Choosing the right option for livestock or animal fencing can be challenging. It can be hard to find a cost-effective, high-quality, easy-to-maintain product among competing traditional and electric fencing solutions. 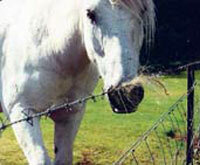 Many animal fencing products on the market are low-visibility, dangerous to livestock or suffer from a limited lifespan. StockGuard offers high-visibility electric tape fencing for all kinds of animals and livestock. Since its launch in 1985, we've developed a product that meets all the criteria for effective livestock fencing, while avoiding many of the issues associated with traditional fencing options. Post fencing is expensive to install and hard to repair. Post fencing does not offer the deterrent elements of barbed wire or electric fencing. It is also only suitable for permanent installation. Traditional barbed wire fencing only lasts between 7-12 years and can require constant maintenance. Because it relies on physically damaging an animal, it can cause significant injuries to livestock. Electric string offers limited physical protection as it is easily breakable. Many varieties are too small for frightened animals to see, limiting their effectiveness. Electric string can easily short-circuit, because with only three wire strands the charge is distributed unevenly over its length. Electric cord is significantly stronger than electric string (resistant to two tons of pressure). However, frightened animals pushing against it can damange themselves (particularly where visibility remains an issue).